The U.S, National Geodetic Survey continues its examination of the impacts to passive geodetic control networks by the planned 2022 reference frame modernization. Editor’s note: A Field Notes article by Scott Martin posed the question, “Are HARNs on Death Row?” and Dru Smith began answering that in the December 29017 xyHt cover story. Here in part 2, Dr. Smith adds historic context to reference frameworks and discusses how the pending modernization differs from legacy iterations and provides much more consistency and reliability moving forward. All text sections within quotation marks and in bold are direct quotes from Scott Martin’s article, with Dr. Smith’s comments after each. Coast and Geodetic Survey (C&GS) magnetometer #18 circa 1897. To this point, consider the following: The majority of HARN marks in the NGSIDB were never occupied with GPS. Compared to the approximately 80,000 GPS stations used in the NAD 83(2011) adjustment, there are about 210,000 HARN marks with no GPS (these stations can be discerned from GPS-derived control because their datasheets lack ellipsoid height, Earth-centered, Earth-fixed coordinates and include a note that says they were Òestablished by classical geodetic methods). However, while both national adjustments relied upon GPS vectors exclusively, it is also worth noting that some of those vectors are older than the HARN surveys, dating as far back as 1983. Because this sentence began with, “For North America”, it triggers a clarifying response. Readers should keep in mind that NATRF2022 (as well as the other three reference frames under development for 2022) are all global reference frames, just as all three NAD 83 frames are. While NATRF2022 will rely upon a newly computed plate rotation model for the North American plate, its use is not restricted either to the North American plate or the North American continent. Certainly, many users who live in North America are expected to use NATRF2022, but users in the western portion of the continent, whose crustal motions match neither the North American tectonic plate nor the Pacific tectonic plate, may find NATRF2022, PATRF2022, both, or neither, appropriate to their particular use. C&GS magnetic station disk “Grey Mag” in Massachusetts, established 1936. Speculation is a dangerous thing, and so this sentence indicates that some mix of “questions not being asked” and “answers not being given” has occurred, which is hopefully being corrected with this response. If something is unclear, NGS urges their customers to ask questions and provide to them their feedback. Scott’s article, by the way, is great feedback and will definitely drive important questions and decision-making at NGS! Aside from that, a subtle but critical detail should be clarified about the above quote. Specifically, during the last national adjustment of NAD 83 in 2011, NGS adjusted existing data within an existing datum. No attempt to re-process the existing vectors was made. That is, a GPS vector computed in 1998 – using 1998 orbits as they were (relative to whatever global reference frame was available at the time) and 1998 GPS processing software as it was was not changed. It was put into the adjustment alongside GPS vectors computed from 1992 surveys using 1992 orbits (relative to whatever global reference frame was available at the time) and 1992 software. This yielded a diverse mix of accuracies and assumptions. Furthermore, these vectors were first transformed to a common reference frame and then “moved through time”, all using the NGS utility Horizontal Time Dependent Positioning (HTDP) (with no attempt to provide vertical motion modeling, except in Alaska) to a common epoch (2010.00). Once the data were cleaned of outliers, the adjustment of data that spanned decades was performed to yield a single set of geodetic coordinates on any given mark, estimated to be at time 2010.00. In 2022, NGS does not plan to combine existing vectors of markedly different ages and qualities in a network adjustment. Nor does NGS plan to continue moving vectors through time” (at all, but especially not using only a 2D technique that ignores vertical deformations that occur over time). A network of triangles was established in surveying the 39th parallel from coast to coast in the early 20th century, tying together elements of geodetic reference frameworks. This historical survey used a mix of terrestrial methods and the famed steel towers designed by C&GS surveyor Jasper Bilby. Further, NGS will no longer adjust data to an existing datum (NAD 83) whose initial realization was created with an almost negligible amount of space geodetic data. The process is wholly different from any previous “realization” of NAD 83.The last time NGS did anything like this was in 1986 when NAD 83 first replaced NAD 27, but even then it was one terrestrial network replacing another and the pervasive philosophy was the same in NAD 83 as it was in NAD 27, which was this: using data that spans many years, attempt to compute a single coordinate set for all marks all at the same epoch in time. NGS will be doing the following: CORS data will have consistent coordinates and velocities in the latest International GNSS Service (IGS) frame. NGS will also compute (alone or in coordination with other groups) four plate rotation models (North American, Pacific, Caribbean, and Mariana). These models will relate the time-dependent IGS coordinates to time-dependent NATRF2022, PATRF2022, CATRF2022, and MATRF2022 coordinates, respectively. NGS software (such as found in the OPUS suite) will provide users with the ability to compute GPS-based, time-dependent coordinates in any of these five frames. NGS will also choose a new reference epoch (TBD) for the four frames. This is a critical part of the plan, as NADCON will be expanded to transform NAD 83(2011) epoch 2010.00 coordinates into NATRF2022 (epoch TBD) coordinates. It will be similar for the other four frames. In this way, geospatial data that is in NAD 83(2011) can quickly and easily be transformed to NATRF2022. But what about getting NATRF2022 time-dependent coordinates on the passive control? That will be addressed farther below. This is absolutely correct. This is the intention, but it is a monumental effort. This will entail finding and trusting the metadata for each GPS file in NGS archives. Unfortunately, headers for receiver independent exchange (RINEX) format files, fields in raw GPS data files, and bluebook files are notoriously full of erroneous information about the two critical elements needed: antenna type and antenna height. So, a massive effort is required to find, read, understand, trust, and digitize tens of thousands of paper field logs. Once the metadata is confirmed, the re-processing will begin by first running each receiver file through OPUS-S and computing time-dependent IGS coordinates at that mark. These will then be converted to “TRF coordinates” (shorthand for coordinates in the four new frames). The second step will be to adjust these individual OPUS-S solutions in a campaign-style adjustment (using OPUS-Projects), likely grouped into time spans between one week to one month. In this way, simultaneous historic projects that occurred in different geographic locations will be directly tied together for the first time inside the NSRS. This will yield the final, adjusted, time-dependent TRF coordinates on each mark for that particular week or month. The reason this effort cannot easily go back before 1997 is straightforward: The processing must be in the IGS frame first, and the IGS is accessible through IGS orbits and IGS coordinates on CORS, neither of which is very reliable before 1997 and neither of which existed at all before 1994. In cleaning the data that went in to NAD 83(2011), the cut-off date for early GPS vectors was driven by the fit of older vectors to newer vectors, not by a complete reliance upon IGS orbits as will occur with the TRFs in 2022. What this means is that older vectors could have been part of NADÊ83(2011). But older (raw) GPS data cannot be included in NATRF2022 (or the other three) through the standard channel of computing IGS coordinates first because those canÕt be computed without IGS orbits. Does this mean those older GPS files are useless? No, not quite. Those files could, theoretically, be used to re-compute the differential vectors between marks without reliance upon the IGS orbits. But such an effort would still mean that the vectors would be ÒunattachedÓ to the IGS (just as they are now, in their existing form). NGS would need to engage in a dedicated research project in order to develop the right methodology to relate those pre-1997 vectors to the TRFs of 2022 before they can be used again. It is not clear whether such a project would yield information of sufficient accuracy and/or usefulness to justify the effort when there are other more pressing needs (such as evaluation and updates to intra-frame velocity models). As mentioned earlier, this wasn’t true in either NAD 83(NSRS2007) or NAD 83(2011), as neither of those included the classical horizontal observation data that went into the HARNs. But, even if it were possible to go this far back in re-processing GPS data, the inclusion of those projects would not have occurred in the same way as in NAD 83. That is, the vectors would not stand as-is, moved through time using a 2D (only) deformation model and adjusted together with decades of other data to form a single coordinate set at a single epoch in time. That method of providing coordinates ignores the rich amount of time-dependent tectonic movement information that exists in 20+ years of surveying and with which the surveyors of the entire western portion of the North American continent are certainly aware. C&GS (now NGS) benchmark set in 1958 in Elko County, Nevada. Many of the existing benchmarks have not been re-observed by the NGS in decades or even since first established. Firstly, without mincing words, the HARN coordinates in the USA are obsolete, from the standpoint of the primary purpose of the NSRS (which is to provide the most accurate, up-to-date geodetic control for the federal government). They are two to three realizations out of date 20 to 27 years old. In California, for example, the 26 years since those HARN coordinates were computed, 26 years of secular crustal motion have yielded horizontal movement somewhere between 2 decimeters and 1 meter (relative to stable North America). Somewhat mitigating the situation, many of the HARN marks have coordinates in NAD 83(2011), which is aging, but remains the most current realization of NAD 83 and is not yet obsolete. Any users still working with the HARN coordinates anywhere in the United States are encouraged to move their data into NAD 83(2011) by readjusting historic GPS observations to NAD 83(2011) or by using NADCON 5.0. Second, many of the marks that were occupied by GPS in the HARN surveys were re-occupied in the FBN surveys (for California, the FBN survey took place in 1998). The data from the FBN surveys will be part of the massive re-processing effort mentioned earlier. However, to be clear, what users will see from that effort will be NATRF2022 (and PATRF2022 and CATRF2022 and MATRF2022 and IGS) coordinates computed at a mark at the epoch when the survey occurred. How will NGS get a NATRF2022 (or other) coordinate on that mark at the TBD reference epoch (likely to be somewhere close to 2022)? Through two methods. The first will be invoked on those rare marks that have seen enough GPS occupations through the years to provide their own estimates of motion through time. The second will be on marks that don’t have enough repeat occupations (which would be the vast majority of such marks), and motion through time will come from an intra-frame velocity model (IFVM). The IFVM will model 3D motions of the crust over time. NGS is currently engaged in research to determine the best data sources for the IFVMs. Using one of these two methods, an estimate of the mark’s coordinates at the reference epoch will be made. Such an estimated set of coordinates will provide foundational data to the NADCON grids that transform into the TRFs. It is true that bluebooking has a reputation for being cumbersome. However, it is not unreasonable for any specification – that attempts to achieve a standard result – to be somewhat cumbersome. Thankfully things are about to get easier. NGS has recently completed a test version of bluebooking through OPUS-Projects (in a project that we short-handedly call ÒOP2IDBÓ) which is available to the public for beta testing at beta.ngs.noaa.gov/OPUS-Projects/OpusProjects.shtml. This is both sad and likely true. While NSRS users in some states have turned in hundreds of bluebooked projects in the last ten years, they are the exception to the rule. Users in most states have turned in significantly less. At last count, only one bluebooked project has come from California in that time. To re-iterate: This means new TRF coordinates being computed on existing marks using the original (1997 or later) GPS data run through modern software and referenced to a modern IGS frame at the epoch of the survey itself. It does not mean transforming old HARN coordinates. Users interested in that are referred to NADCON 5.0, where transformations already exist to move data from the HARN, to the FBN, to NSRS2007 to 2011 (and eventually to the TRFs in 2022). In order to provide data to NADCON that will allow NGS to build a transformation between NAD 83(2011) and the TRFs in 2022 (as well as to provide VERTCON with the data to transform from NAVD 88 to NAPGD2022), NGS has initiated a new project called “GPS campaign for transformations,” being led by Galen Scott. The goal of that campaign is to have as many “recent” GPS occupations on marks with NAD 83(2011) and/or NAVD 88 (preferably both) coordinates. In this graphic from the NGS, ellipsoid height difference between NAD83 and the new reference framework will vary from approximately -1.0m in the southeastern U.S. to approximately +1.0m in Alaska. Supporting the above campaign, NGS is also engaged in research and development to facilitate such GPS surveys specifically aimed at using RTK/RTN data. NGS is currently engaged in some internal discussions about developing a prototype of OPUS projects that accepts mixed long-session GPS/RTN surveys by sometime in 2018. Feedback on that question is most welcome! NGS has recently developed a prototype version of OPUS projects that performs bluebooking (and thus makes it a valid streamlined path for GPS surveys to be turned in to NGS and included in the NSRS in the NGS integrated database, or NGS IDB). This prototype tool, OP2IDB, is available at the link mentioned on page 20. Such a tool, it is hoped, will alleviate some of the onerousness of bluebooking while not removing the important standardization of data which bluebooking has provided. As mentioned in the original article, there will be a third ‘Blueprint’ document in 2018 that will address the re-invention of bluebooking. That is, the document will answer questions like, “As a surveyor, how do I use the new reference frames?” and “What will datasheets look like in the future?”, etc. Begin by talking to your regional advisor (ngs.noaa.gov/ADVISORS/), but also look for guidance in the next year coming from NGS. In an actively deforming area like the western USA, periodic surveys turned in to NGS will keep coordinates up to date. With a simplified bluebooking process (through OPUS projects) and a possible portal for RTK/RTN data, NGS hopes to see a resurgence of data turned in from all corners of the nation. I conclude by re-iterating my thanks to Scott for writing an article that stimulated so much thought here at NGS and that shows how much importance the passive control will continue to play, even as NGS modernizes the NSRS. Milbert, K.O. and D.G. Milbert, 1994: State Readjustments at the National Geodetic Survey, Surveying and Land Information Systems, v. 54, No. 4, pp. 219-230. Soler, T, J.D. Love, L.W. Hall and R. H. Foote, 1992: GPS Results from Statewide High Precision Networks in the United States, Proc. Sixth Int. Geodetic Symp. on Satellite Positioning, The Ohio State University, 17-20 Sept., 573-582. Strange, W.E. and J. D. Love, 1991: High Accuracy Reference Networks; A National Perspective, Presented at ASCE Specialty Conference Ð Transportation Applications of GPS Positioning Strategy, Sacramento California. 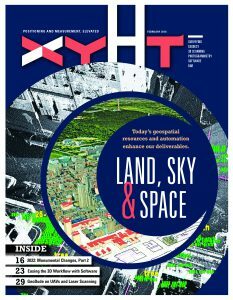 Click on the cover below to view the other articles in the February 2018 issue of xyHt magazine.